BankBranchLocator uses your browsers built-in geolocation API or GPS data from your mobile device to locate nearest bank branches in your area within 50 miles radius. Use Bank Branch Locator to find nearest brank branches in your area. Get lobby hours, available services, driving directions and more. 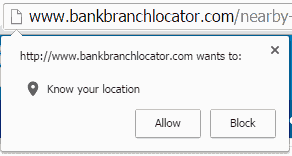 The browser you are using will ask you for your permission to give your location. When you first visit this page, you should see a box appear asking for your permission to give your location. Select Allow or choose from the dropdown list. The image below is an example screenshot from Chrome browser. This site is not affiliated with, maintained, sponsored or endorsed by a banking institution or any government agency. Bank and branch information published on this website may not be true or accurate at all times. BankBranchLocator.com assumes no responsibility or liability for the accuracy or completeness of the listings.